Neil George, MA Broadcast Futures, 2010. When I first began my MA major project I wanted to explore the use of technology within education. I found this to be a fascinating topic, as this is something that is fairly new to the UK, especially with regard to broadcasting. Technology in modern society seems to be at the heart of everything we do, whether business, financial, education or entertainment but, it can be seen that as far as the UK is concerned, we seem to have not embraced educational technology to the same extent as they do in other countries such as the US. I felt that this would be a very interesting topic to explore further in order to see how educational facilities use technology and also see how government is looking to these technologies in order to enhance the educational process for the benefit of future generations. Within my own practice I enjoy to learn from many different sources and so I felt that it would be very interesting to see how broadcasting could be affected by the enhancement of new technologies within education and to see how the delivery of education is going to change in the future because of these available technologies. On continuation of my research I wanted to explore educational facilities where technology is used to their advantage and how these technologies are delivered to the learner. Is it self-directed or teacher lead? This then led me to explore the topic further as I wanted to understand and look at the whole history of education and how government policies have an effect on the way in which education is delivered to all levels of learners and also how much influence government and government bodies have on the types and uses of new technologies. So, within this document I will explore further how education, technology and video can work together in order to enhance this, especially that relating to broadcasting. I will look at the history of education, from the Forster Act of 1870 through to modern day educational policies, in order to see how education has developed and evolved over time and how modern education has instigated new practices, new policies, and new technologies. I will also look at what kind of impact these have had and will have in the future on students, lecturers and educational facilities and establishments. Politics, globalization and political agendas will be researched and I will attempt to examine how these have had an effect on educational practices and what current policies are being put in place in order to develop the use of emerging technologies in comparison to previous policies. Two very important questions will then be explored, namely, why people learn and how people learn. These are essential questions when looking at the enhancement of education through non-traditional learning environments and so I will be researching this in order to see how willing the learners are to use new technologies to enhance their educational experiences. It is also important to explore how human behaviour has an impact on the way in which education is delivered. I will also look at how these effects brought about changes to both educational establishments and educational policies, which in turn changed the way people, can learn and want to learn. It is also very important to look at what technologies there have been and what there will be in the future. Naturally, the development of new and emerging technologies came about as a result of social, political and educational changes. These have also assisted in the way that education is and will be delivered. I will then explore some of these technologies and examine what I think might lie ahead for the future of education. The reason why I want to explore this subject is because of the way technology is being used within modern society in order to enhance the way education is delivered. But, I want to look at this and see if the technology is being used in the most appropriate way and whether or not learners, and in particular broadcasters will be able to learn by using new technologies and new educational practices. I think this is very important to explore because we have learned a lot through the use of technology but does it take away from the learning experience of one to one teaching and mentoring? I want to discover whether the use of these technologies will be a good thing or will it create new communities who believe they have a solid understanding of a subject but in professional practice they lack the community and communication skills in order to pass on this information to other learners? Does the use of technology take away from the learning experience and rather than having an educational and emotional experience, the learner is left somewhat socially inept when dealing within a professional environment? Education in its earliest form was created in order to pass on knowledge from one person to another but with the use of technology, the computer system has almost become the teacher and social interactions will be lost. I. History of Education and its politics. In order for me to evaluate and look at online learning and education I felt it necessary to look at education as a whole and look at its history. When thinking about looking at historical elements of how something has evolved and changed over time I find it very useful to look at the specific word to first of all discover its origin. The word education comes from the Latin, ‘Educare’, meaning, "bring up, rear, educate," which is related to ‘educere’ "bring out”. This is in its earliest form acknowledges the need for people to ‘bring up’, which in some forms of thinking could be thought of as the natural evolution of human life in its basic forms; birth, life and death. The bringing up of life and ‘education’ is a natural desire for any parent in today’s society but where did it start to become a more formalised practice? The history of education has become a practice of teaching and learning in whatever form was available to mankind as it evolved throughout time. Perhaps we can go back to origin of our species, around 200,000 years ago and we see that many tribes had beliefs, values, practices and specific knowledge that they passed down throughout the generations from father to son. This is a distinct form of education but a very much informal ‘learning’ method, but we still see this in today’s society and especially in more practical forms of working, such as electrics or plumbing. In fact, the use of education could be seen as far back as the cavemen. They drew on walls in caves in order to depict their lives, therefore allowing people to see nowadays, and therefore be able to see a distinct form of progress or education and learning as to how this species of man evolved over time. People in modern society then studied these in order to gain knowledge about how they used to live in pre-historic times. Once again, we can see another form of education or ‘passing on’ information in order to learn. With the evolution of mankind and the development of writing skills and tools we can see more of what we would refer to today as a more formal classification of education. Being able to write would also need having the ability to read and thus the need for educating had come about. The Mesopotamian’s writing systems and the Egyptian hieroglyphs could be classified as some of the earliest recorded forms of educating through written forms. The Mesopotamian’s writing was a form of keeping accounts and the Egyptians would depict events happening. In fact one of the earliest recorded alphabets was developed in Egypt around 2000 BC. The era of modern education in the UK could be considered to stem from the1870, Forster Act, which paved the way for the national system, as it required the establishment of elementary schools nationwide. This was the start of universal education being available for all instead of those who were lucky enough to be able to afford it. From this ideology the country was divided into districts and school boards were elected in deprived areas, which were to become responsible for raising funds in order to maintain the schools. These schools had to guarantee attendance for all children within the district between the ages of 5 and 13. After this, other education acts followed including the Balfour Act and the Fish Act of 1918. As we entered the 20th century education as a whole became more of a social, economic and political issue. It became clear that education was very important to the nation and to the individual. The Butler Act was introduced in 1944 which proved the foundation for the system we have in place to-day. During the 1960’s further and higher education took on dramatic changes in what they were to offer. When first created the main purposes of universities were to educate through the use of academic courses; training people to think logically and coherently, and teaching research skills. In the 1960’s we saw the introduction of the ‘polytechnic’ university and college that were created in order to deal with more practical skills. This meant that they offered more practical or hands on courses rather than academic courses. Between 1965 and 1992 all degrees from polytechnics were validated by the Council for National Academic Awards (CNAA). These degrees were recognized as equivalent to a university degree but the courses were placed under strict scrutiny from external examiners. After 1992, and the new Further and Higher Education Act they were all given status as full universities and therefore able to give out their own degrees. This is very important to consider in terms of the difference between traditional universities and the ‘new universities’ that were originally formed as ‘polytechnics’. In the modern era of politics and especially throughout the 1990’s a university degree based education was seen as a necessity in order to get a job. However, the technical side and more practical sides of education were overlooked and skills gaps were created. This came about in many industries and especially within broadcasting and production. It therefore became evident that these skills would need to be filled and also universities would need to cater for these types of courses. This is where colleges and more technical universities (polytechnics) came into their own, in creating opportunities for these skills to be developed, where the original university could not offer this type of learning. Education at this time was also experimenting with technology and many practical based courses became available for people to re-train themselves with the appropriate needed skill base. The academic approach to education had become somewhat outdated in some peoples opinion. However it could be argued that perhaps the distinction between the theory and practice had become blurred. When in the past a traditional degree was seen as purely academic and theoretical, with the introduction of more practice-based degrees the line between academic and technical has inevitably merged. However, is this really a good thing to have? Education had come under heavy scrutiny for only offering academic courses but now it seemed to be offering more practical based courses with some theoretical learning attached to it. Will these mean that academics are no longer needed, or are we passing through into a new form of educational policy? Should we go back to the days of more traditional degrees and anything practical based should be taught through a practical means? The way in which politics affects education nowadays is crucial to the development of all educational facilities, communities, people, and the process of education itself. Should we cast aside the history of education for modern technology or should we embrace modern technology and allow it to enhance the learning process? How do political issues reflect upon the way education is and will be delivered in the future? Do they embrace and use modern day technologies in the right ways or is government out of touch with what learners want in today’s society? It could be said that, all education has stemmed out of politics and thus politics leads the concept and ideology of ‘learning and education’. From as far back as recorded civilisation, rulers and politicians have played a key role in educating its people, in order for them to learn and grow as a community, a society and ultimately as the human race we are today. Some might argue that if it weren’t for monarchy and politicians there would not be places in which to study at all. Others might argue that religion played a key element in educations as during the ‘Middle Ages’, the monasteries of the Catholic Church were used as centres in which to educate. But, in modern society and particularly throughout the 1990’s educational policies within western societies gained considerable support as they were perceived as removing bureaucratic constraints upon personal freedom. Obviously, within the context of this dissertation it is not possible, or relevant, to go into a vast amount of detail about political issues within education but it is interesting to see how politics effects the way education is delivered across all platforms. The distinction is now blurred between academic and technological education since the former cannot exist without the latter. In 1996 the Education Act consolidated all previous education acts since 1944 and a new era for education came. This Act fully opened the era of education for all and the Government policies of encouraging, and setting targets, for 50% of the “leaving cohort” to aim for a university education has brought about a rapid expansion of new institutions and the rise of non-academic courses relying heavily on new technology. This trend has continued to such an extent that we see overflowing universities and many disappointed students with the appropriate academic standards unable to gain a place. After exploring the history of education I felt it was necessary to look into why people learn. So, why do people want to learn? It is very important when thinking about why we learn to also look at who is the learner. Teaching children and adults can be very different practices and in fact different methodologies all together. Each has different needs and wants for their own learning and life experiences, whether it is knowledge or life skills that they are exploring. 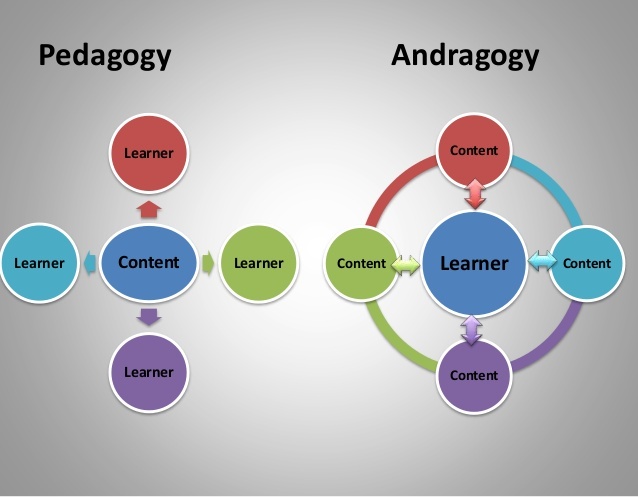 If we look the meaning of both, pedagogical and andragogical learning we can see that they both have very different targets and also the way in which each is approached is very different in teaching methodology. The andragogical experience is seen as somewhat different to pedagogical learning and therefore one must assume that the processes need to be different as well. So, if we are to think about the learning experience of university students for example, where do we place them? Are they to be considered as children or adults? What about mature students? I think these questions need to be considered when thinking about teaching practice and also the use of technology. For example, with children we assume that they have little knowledge of the subject matter, and adults we presume will have some knowledge. But is this always the case? However, with adults do we always presume that they can instigate a high quality standard of self-directed learning, and achieve the best outcomes in conjunction with the learning outcomes and achievements of the course? So, thinking about these types of learning methodologies, why do people learn? Naturally, for children this process is something instilled from birth. They learn to walk, talk and after this point they start to gain knowledge. When they reach a certain age they will go to school to have a more 'traditional instructional approach' to learning, delivered through classroom based teaching. But, after completing schooling, which we perceive to be high school, students are thrust into a different style of learning through college and university. So, it could be seen that there are many reasons from this point why people want to learn. Several philosophies behind why people want to learn might be seen as innateness, maybe a fascination of the subject or a necessity for their future or current work. Maybe it is just from having a curiosity about the general subject matter or is it just done for the sake of the learning a new process? All of these points can be argued for both children and adults alike, but perhaps when it comes to university or higher education we need to think about an in-between stage of learning that is neither adult nor children. It is therefore also very important to consider the delivery of these types of education. An adult learner could well be considered mature enough for self directed learning where as children need to have a kind of direction, whether from their parents or from the teacher. But, this can be difficult when considering university students because perhaps although they consider themselves to be adults so lack the maturity to fully understand self directed learning. Because my project is more related to adult and university learners, in particular production and broadcasting I wanted to see if there were more practical styles of teaching methodologies. If we look at ‘constructivist learning’ in order to see how that works in terms of the adult learner. Perhaps this could be a good methodology for an adult/university learner, which could also embrace the use of online learning to their advantage. Constructivist learning thinks about the learner as an individual, how people learn, the nature of knowledge and where the responsibility of learning should reside increasingly with the learner rather than a collective. It is more to do with the 'experience' of learning and learning by 'doing'. This is an important point to consider for the adult learner especially as they will need to be aware of the need for self-direction. The principles behind learning or educating could be an active process in which the learner constructs meaning out of the subject. Over time people will naturally develop the ability to learn more and build on their prior knowledge and experiences. In my opinion, knowledge is more easily assimilated where the learning experience tends to be of a more practical nature. Experience is vital to the development of the individual in improving their learning capacity. When we think about online learning cultures it is essential to gauge and understand what the ‘learner’ wants to gain from the experience and how the knowledge and information will be transferred to them. Whether, by e-mail, online resource or video tutorials, it is very important to make sure that they are able to reflect on their learning experience and they must understand why they want to learn within this environment as opposed to learning in a more traditional environment. Are they seeking to apply the knowledge to their daily routine, such as their work or is it in order to increase their understanding of the world about them in general? Once they have a clear understanding of their own needs they can then reflect on their work in a more constructive way, which will then allow them to expand their knowledge within an online environment. Not all learning needs to come from traditional methods but it needs to be justified why the learner is choosing an online facility in order to learn. Now that I have explored why people want to learn in a theoretical and practical context, I think it is very important to consider how people learn. Not everyone is the same and all people like to be educated in very different ways, from books to online learning. Each of which has its’ own very unique form of teaching the subject. Perhaps we have seen more traditional forms of studying no longer regarded as the best form of education. Spending long hours in a library gaining knowledge from books is perhaps something to be laughed about in the future, but maybe we need to think about the ways in which we should be learning in the future and not just consider the fact that we have all this modern technology and therefore must use it. We should also think about the individual rather than the collective if this is the case, but can we always do that? Each individual will have different reasons for studying but do teachers take these into account when they are teaching them or do they just teach as a collective in order to pass on some sort of information? As well as this, the way in which learners can access information and knowledge has completely changed but having information stored on a computer system is not necessarily always going be a good thing, and what happens if that computer system fails to work? Do we turn back to hard copies and start to read once more or do we just forget about the information and lose the invaluable sources we once relied on so much? The way in which learning has changed over the decades is astounding to see. With the use of newer and faster technologies everything can be made available at the press of a button. Who is to say that the information people are receiving is genuinely correct? The information and knowledge being passed down by well-known scholars and teachers is perhaps something of the past but does this mean that the information is correct or does it mean we need to re-evaluate our teaching methodologies all over again? This I think is essential within new age teaching because it is not just about having the knowledge but learning how to use this knowledge and be able to take control of their own learning experiences. It should also be about the process of obtaining knowledge and then being able to reflect upon that knowledge in order to use it in an effective way. It is also important to look at how people access the information and from this access what kind of interpretation they bring about. The way in which the learner can interpret information will differ from one to another. This interpretation will also differ on how the learner obtains the information, whether from a book, a lecture or from an online resource. Each way could potentially differ in its delivery and so the learner needs to consider this when accessing information. This could also lead to learners interpreting their own meaning of the subject matter, which could be miss-leading from the original sources point. Another point is about how the learner uses the information in order to develop his or her own ideas and enhance the research within the subject. This is where online learning might have issues, as with examples such as Wikipedia, it has often been seen that the sources come from other online websites or articles and so, how do we know that this source is justified? We need to consider how people access information a lot more in the future and how they interpret it as well. Information is already easily accessible but each individual learner will make their own observations and interpretations about this information and so we need to make sure that the sources are checked and the information is coming from relevant academics or professionals. We really need to be very careful in the way in which people learn in the future because at the end of the day any educational information needs to be based on research, understanding and knowledge. Maybe this is something at the moment modern technology is limited by? We also need to consider the amount of information that is being passed out and whether it should be checked before being made so readily available. The source of that information needs to be checked and verified and surely this would lead back to an original source, such as a textbook or author. The way in which people learn will naturally change over time and we are now moving into a very technological era for education, so sources of knowledge and information have to be reliable and easily traceable and we must have hard copies in order to know the origination of the information or our whole history could end up being deleted at the push of one single button. We need to consider how much we should allow technology to influence the way we learn and educate, and find the most appropriate methods in which to use it before we become too reliant upon it. I think this is key to education and the way in which education is delivered, not just in schools but also through all levels of education and to all levels of students. The most important thing in learning is making the learner appreciate and enjoy the subject they are studying. If they don’t enjoy what they are doing then they are more than likely to stop doing it. I find that this is a big problem with modern educational systems; they seemed to have lost the enjoyment of teaching subjects and look at students as numbers rather than the next generation of professionals and teachers. If we can promote the way in which story telling could enhance the learning environment, then I am sure we would be able to see a lot more confident and excited learners. This is also very important when it comes to broadcasting because TV, film and online video are all about telling stories. Whether it is an advert, a TV programme or a film they most important point is engaging the audience and delivering the message to them in an interesting way. McDrury and Alterio (in 2003) proposed this five-stage model for reflective learning through storytelling, which was mapped against Moon’s (2002) five stages of learning. This model uses the idea that the starting place for any storytelling is when a particular person first chooses to what story to tell. The expansion and processing phases of this model are used for questions, in order to develop the story or question it and the reconstructing phase is all about evaluating the story and any implications that might come from it. These are very interesting points to consider when teaching higher educational students as it will enable and allow students to reflect upon the situation and gather their own reflections in terms of the learning outcomes within the course. If used within an educational facility making a subject interesting is all about storytelling and therefore the story would become the learning phase for the student and so considering these five points would be very useful for teachers to think about. This would also engage the students and allow a lot of reflective thought about the particular subject, which they can then instigate throughout their own working methodology. I am sure that the idea of reflecting on ones work has been around for a long time but it seems that recently educational facilities have explored this a lot more than in the past. These days and especially within higher and further education facilities, students are encouraged to reflect on their work in order to see how they could have improved on it. I think this is a great way in which to develop a student into a more professional mode of thinking for their future. They need to understand how a professional environment operates and they will always receive feedback from clients in regard to the work and then reflect on this in order to improve it to the specifications. If the students therefore have reflective skills this can only enhance the way they will work in the future. As well as this, the reflective process needs to done in order to appreciate that what they are doing has reached an acceptable standard. Once they understand this they can then collaborate with others in order to pass on this information. That is a very important point that has to be thought about within higher education. The ‘passing on’ of knowledge or information can be done between learners and directed by the teachers if needed. This then provides a need for a community environment, collaboration between learners and teachers and of course competition in order to get the best possible results from the learners as well. In today’s society, collaborating with others in a professional environment is common practice and it is somewhat rare to work on your own. It is therefore essential for learners in higher education to engage with collaborative learning; this can also be done within an online environment quite successfully. However, it is very important, when collaborating with others you are also fulfilling your own learning requirements. This can sometimes be hard to achieve within a traditional learning environment in comparison to online learning but if the team work well and use each other’s strengths then each individual can actually concentrate on their own unique learning need. This is something that I would encourage within a professional environment and so learners need to be aware of their own strengths and weaknesses in order to make the best out of collaborations. Once this has been achieved, learners will be able to impart and gain knowledge about different subject areas as well as reflect on the process of the collaboration, which in turn will lead them to have a better understanding of their own skills. Another important point to consider when collaborating is the people you are working with. You will need to build a team or small community that can communicate and work effectively together in order to get the work done. But, how important is a community environment when learning? Community learning whether we see it as a local community or just within a classroom clearly is all about collaboration. We need to be able to work with others in whatever possible way we can and most importantly we need to work with them towards a common goal. This is a very important point to think about and consider with education because usually education is delivered to a large collective and you as an ‘individual’ need to gather the information and use it to your advantage. But, within a community or collaborative environment the goal is the end product and working in order to achieve that goal needs to be the most important thing. What you learn along the way can be considered as your ‘learning experience’. So, maybe another important question that must also be considered is how has learning changed community development or in fact, has it had an effect on the community environment at all? How is a community affected by education? A good case study for community development within education can be seen from Finland. Although, this is based more towards child development it is very interesting to see the way in which they educate the students. They allow the students to have a lot more free time than we would in the United Kingdom and the parents are involved with the children’s education a lot more as well. Another important factor about Finnish education is that the teachers must have a Master’s Degree in order to teach the students, which therefore means that they have studied a subject to a specialist level. I think the strength behind Finland’s education system comes in several forms. One is that the teachers need to be qualified to Master’s level in order to teach at school. Also, in South Korea, you are unable to teach at a university without a PhD. So, will we in the UK find a lack of Professors for our future learners? Perhaps this will be an interesting topic to look at over the coming years, with universities receiving less funding each year and more students. Will they look to hire more Professors and make them teach larger classes? Will this then have an impact upon the learning outcomes and the way in which students learn? Another important factor to look at is competition between schools, colleges and universities in both terms of students and funding. It can be clearly seen from the Finnish example that they educate as a community, involving parents, teachers and most importantly the students themselves throughout the learning experience in a collaborative environment. In both the UK and USA a considerable emphasis is put on the value of competition: for example parents will be encouraged to choose a school because of its successful league table status. This inevitably leads to some schools, universities and colleges succeeding whereas others will not. Is a competitive environment actually the best way to educate students where statistics matter more than imparting knowledge and learning? In fact, we have recently seen from the 2010’s A Level results that over 3,000 ‘A’ grade students will be turned away from their chosen university due to competition for the restricted number of places available due to funding cuts. What does this mean for future generations of learners? As we see from Finland, the education system is far more relaxed and encourages group learning a lot more and from this we can see that the results speak for themselves. Perhaps this shows the rest of the world the way in which they learn works. But, maybe this form of learning would not work for other countries the same way it works for Finland. Another interesting study to look at here in terms of competition would be South Korea. Every day, South Korean students study for almost 3 hours more than those in the USA and UK. But, does this actually benefit them in the long term? Their dedication to improving the chances for children and young learners is astounding when compared to other countries and the students appear to be driven by the need to be successful. It is all about getting into the best university in order to get the best job available and with the large amount of competition there is within the country this will naturally lead students to study for extended periods of time. It is interesting to note that in Finland, education is free, whereas in South Korea it is not. Korean families tend to spend considerable amounts of money on their children’s education and often they look to foreign schooling in order to try to enhance their future prospects. Most of the universities in Finland are state owned and they encourage students through both academic and practical courses. In South Korea, there is a mixture of state and private owned universities but even the state owned ones have a cost to bear. Governments in both countries promote education but they do this in different ways, with similar outcomes. However, I think the significant difference between the two countries is the attitude and culture with regard to education. Finland has a collaborative and relaxed approach to teaching and learning whereas in South Korea they have very intense learning environments. Finland has perhaps been allowed to develop these educational practices without exploitation from others. The South Koreans on the other hand had years of exploitation by the Japanese and then the Korean War. These I think lead the next generations to see opportunities in which to restore control and pride to the nation, and allow them look to their future, therefore allowing the younger generation to become more prosperous with the emphasis placed on education. Also, perhaps, considering the Confucian ideology, ‘Knowledge is a passport to status and wealth’ could be an issue here because the people certainly believe that the higher your status is, the wealthier you should become. This philosophy has definitely led to a huge amount of human competitiveness in Korean society. Maybe, we can learn from both of these educational systems in order to develop our own, which could be seen as somewhat staid in comparison. But, we should also look at our own history of education in order to develop new ways of enhancing our learning methodologies for the future and take some good points from others. We tend to see a lot of competition within the UK, universities, schools and colleges all competing on national averages and league tables. But, maybe they are more interested in just getting a higher pass rate in order to receive better funding than enhancing the learning experiences? Are internet based learning courses being used towards a university’s statistics? If they are, do they offer the same knowledge environment that a learner would get if they were on campus full time? Will online learning be able to offer appropriate degree based courses where the student has enough contact with academics in order to achieve the learning outcomes for the course or not? The idea of competition in education is a good thing to have. However, with UK universities losing funding and more students wanting places, how can each potential learner have the same opportunities? Are we asking a lot more of younger learners these days than we did previously or are the exams getting easier? This is a very important point to think about when offering online courses, as we can now see that there are a lot more universities in the UK offering online degrees. Should we really consider university as more than just a piece of paper rather than as an educational experience? This seems to have been somewhat lost over the past decade or so due to politics and so perhaps we need to explore once again what is meant by a university degree. We saw in the 1960’s the introduction of Polytechnics in order to satisfy the need for less academic educational courses but what will we see in the future? Will there be a lot more online facilities that can offer the same learning environment as a campus university? Will there be other kinds of educational institutions in the future who offer new ways of learning that can compete with modern day universities and colleges? I believe that this is a very important point to think about when considering online learning. The original purpose of universities was academic research but then with the introduction of polytechnics, higher education became a mixture of both practical and academic but now we have online learning coming into this mix as well. So, we need to think about where online learning will be. Is it more to do with training than learning? This needs to be established when offering online courses or thinking about learning within an online environment. It will be very interesting over the coming years to think about new styles of learning, especially within the online arena. Obviously, universities are already offering online degree and professional courses but are these courses actually fulfilling the learners needs and wants? Of course they will end up with a degree or qualification that will help them develop but will they have grown in the same way as they could have by learning in a university environment? There will in the future be an expansion of ways to learn, which will involve a combination of all styles of learning. Even now we tend to either learn through one form or another but with the use of technology, educational establishments will have to start offering learning environments that suit the student, rather than only offering static ways of learning. Perhaps in the future it won’t be about the facility but it will be more about the ‘learner’ and what they want to achieve from education. They will use a more constructivist learning style and take control of how, when and where they want to learn and even who they want to teach them? Even today we have seen courses offered in different ways but still the university will remain in control of the experience. In the future we will see a change where the learner will become a lot more responsible for their learning experience whether online or classroom-based learning. Knowledge will be passed on and filtered not just by teachers but also by students and especially in broadcasting. Broadcasting is quite different from many other areas of education, as you need to be using and doing in order to learn. There is only so much you can learn through academic research, but this also means that the learner will need to have the facilities available to them in order to progress their learning. This is also where online learning can only help a small amount because the learner will learn a lot more from going out to film than watching online tutorials. However, if they don’t have access to equipment or collaborative environments then they will be disadvantaged. I think this is where international colleges and universities can take advantage of online learning and use it as one learning method as part of their course structure. Offering students access to online resources can enhance their learning experience but they still need to have regular contact with other learners and teachers. We have seen the introduction of new universities (polytechnics) and more recently CLC training centres (for younger learners) in order to deal with more practical and hands on issues rather than academic ones, but I don’t think online learning should be considered as a ‘centre’ for learning. It should be looked at as a resource for learning and I think this is very important point. I think we will start to see new ways of learning that will involve a variety of different ways through which the learner can engage. This will come about from the ‘learner’ and probably not from establishments but they will have to adapt and change in order to meet the demands of new generations of learners. I think there will need to be better definitions between learning and training within these facilities and also the teachers will have to understand different methodologies of learning and adapt to each individual learner in order to deliver a comprehensive learning experience. With this we will also find new ways of using technology in order to deliver better learning experiences. We need to be able to offer learners much better resources than we currently do and also they need to be relevant for the learner. I think that the way in which different digital media systems will be used even more in the future will impact significantly upon the way learners interact with their educational experiences. Already, we have seen over the past decade a vast growth in online learning and learning via DVD’s or CD’s and this is only going to increase as we move a lot of references, journals and books into an online format. Information is more easily accessible these days and will continue to be stored in servers rather than in libraries. But, we will still need the source references because as we all know, computer information can be easily manipulated, transformed or deleted and so if we solely rely on computer systems to give us information perhaps this information will become jaded over time. Scanning or copying books to a computer system is one thing but finding someone who can re-iterate the meanings and pass on this knowledge to other students surely needs to be at the forefront of any educational policy and we should not be reliant on Google or Wikipedia to pass on this information with un-known sources and references. Or should we? However it is important to keep an open mind when selecting and using a wide range of these types of resources. There is also a danger that students will access information in this way, which they can pass off as their own work leading to accusations of plagiarism. This is another interesting point and by doing this we are allowing the user to take more control over the information that they receive as well as what they learn. However, care is needed to establish how we allow the user to utilise this information and make sure it is used in the correct contexts. This would be something that the teacher can check with the learner as long as there was regular communication between the two. I don’t think the internet or computer based information can ever replace books or journals but they are being used a lot more today than even five years ago and as the source information improves I am sure that we will see this continue significantly, as more and more people become used to online learning and online resources. This will also allow learners to use this information and write their own thoughts about it, perhaps in ‘blogs’, and then this information and knowledge can be reflected upon and used in different contexts for other learners, therefore promoting a more collaborative online environment. I believe that culture and education should go hand in hand, as without one you cannot have the other. So, it is therefore very important to understand ones culture in order to understand its educational systems and policies. I think when it comes to online learning this can be a very difficult thing to do because you are not immersing yourself into the society when using online learning facilities as compared with attending university. This is a very interesting statement to consider because when does a computer become responsive? When there is another user involved? I think it is important to think about a computer as being an information resource. Nowadays, the majority of books can be downloaded, a film can be easily watched and information can be easily displayed. Even teachers can be contacted via either text or video based interaction. So, if we consider computers to be information resources, then we can think more progressively about how learners can gain knowledge and information in an online environment. However, when learning in this kind of environment we have to make sure that the learner is conducting his or her own learning rather than learning from a more traditional teaching methodology. But, are learners losing out on a cultural experience that they would have gained from learning within a more traditional environment? Culture needs to be considered as part of an education, as it is very important for someone to learn about themselves, the world and the subject they are learning. With the right input of computer based learning perhaps they can explore things they would not have originally considered within a traditional environment. We can see that the way in which people are learning is changing significantly and that the learner is also now starting to take more control over what, how and when they learn. This is a very important point to think about as we move into a more technical learning environment. Human behaviour is changing and people are becoming more open to new ways of educating themselves and this will lead to other new ways of learning, understand and sharing knowledge and information. But, we need to be very careful about how we understand and use this information and also how it is passed on in the future to others. Perhaps we need to even start to separate the learning experience even more between academic and practical worlds before they become so blurred it will be difficult to see the differences. Or alternatively, we need to study for longer and gain a much more substantive understanding about a subject before we are allowed to teach it. We definitely need to consider how the human learning experience is evolving and make sure that the experience is still one of academic merit that uses our history of learning as a means of passing on knowledge from one generation to the next. It was important for me within the practical element of my project to consider the learner in an online environment and how they can use this type of website. This was even more so important within production environments because broadcast learners are particularly used to learning using a hands on approach. I wanted to make sure that whatever resource or information was available on the website it kept the essence of broadcasting and allowed a more hands on approach. If we look at all the online resources that are available today it is clear that people are interested in using online learning, and in particular online video is becoming ever more popular as a learning resource. There has been a significant emergence of a lot of online courses over the past few years it is very important to consider the user in this format. It is also very important to consider how much contact the lecturers have with the learners. This needs to be very carefully considered as the education needs to be useful for the learner and they should demonstrate through the course a clear understanding to the level they are looking to obtain. This is particularly important with regard to broadcasting because this subject is a very practical subject and also it is usually done within a team environment. So, when offering some form of online resource it needs to be relevant and useful for the learner. This is why I wanted to have many different resources available, so the user can then choose what they want to have access to and reject what they didn’t want to use. It was also important for me to consider the level of the learners and make sure I could have a range of levels available and also allow the more highly skilled practitioners to add content to the website in the future. This means that the learner is also learning from professionals, who are working within the industry and therefore using live examples of work. This will add to the quality of the resource, information and the learning experience overall. We have seen a rapid expansion in educational facilities offering online learning over the past few years and this will only grow in the future. As well as this the way the learners and teachers interact will change, with the creation of new learning environments that will take advantage of the use of the Internet in order to explore new teaching methodologies. If teachers embrace these new technologies and use the Internet wisely I think it will only enhance the way education can be delivered. When considering learning within any environment the teacher should have a clear understanding of what the learner needs to gain. Clearly, the Internet and online resources have allowed information to be accessed a lot easier than before and if used appropriately can enhance the learning experience. Online resources are also going to be something that will be used considerably more in the future, with the increase in broadband speeds and downloadable information. Teachers need to play their part in this by embracing technology and the use of the Internet within their practice. Of course there are always negative points about anything related to change or advancement within society, but if the technology is used to the best of its ability then surely this is a great way to advance society in general. If you only consider the negative points and use them in a positive way, you can then have a more positive experience with whatever it may be. But, we should also realize that this technology and information is here now and will continue to grow in the future. If it is used appropriately and the sources are relevant and academic in basis I believe it can only be a positive step towards new learning techniques. The teachers need to be careful about the way they use the technology and also take advantage of the learner’s knowledge, as they will possibly have more experience in using some technologies than the teacher. If this can be done then current and emerging technologies will play a significant way in which people learn in the future but will not hinder upon the learning experience. In having access to fast information it allows research to be carried out at a much quicker rate, but will this effect upon the quality of the research or not? With web 2.0 used a lot nowadays, and 3.0 becoming more widely understood it will be used a lot more in the future, and even the possibilities of web 4.0. It is clear that the Internet will play a significant role within education in the future, in terms of both learning environments and resources. We can see this from the way people interact when using online environments nowadays and the constant use of blogs, twitter feeds or facebook are encouraging the use of social networking as a source of information. But, we haven’t as yet really expanded this style of information sharing into the educational arena. Maybe in a few years time we will see this as a new style of collaborative learning. Naturally, in doing all of this research for my major project it really helped me to see how education has developed and evolved over time. This therefore led me to the concept of developing something that would be useful for broadcasters and producers but also allow them to be in control of how and when they choose to learn. From this point, it made me start to think about exactly what I wanted to create and also what I wanted to achieve with my project. In order for me to fully understand the need I decided to undertake surveys with students, lecturers and broadcasters in order to find out what they felt about online learning and especially the use of online video as a learning resource. Thinking about this and all of the research I did, I wanted to look at how I could instigate an online learning resource for broadcast disciplines. The main idea behind the project was to develop an online facility to educate both students and professionals who study and work in broadcasting disciplines. In creating this online resource it would be used to enhance the way in which they learn and also provide a variety of resources so the user can take control of their own learning experience. One of the main points behind the project was to see if the user could take control of their own learning experience if they were to be given the appropriate resources. I set about researching the practical elements of the project through initial surveys, in order to discover if this would be something both students and lecturers would be interested in. I gathered some very interesting responses from the surveys which led me to look at exactly what kind of resources should be offered as part of an online learning facility, especially that relating to broadcasting. When students responded to a question about learning they answered that they would be most interested in learning within a more 1:1 environment than any other. This was very interesting because this is something that could almost never be done in a more traditional way but could be done through a mixture of online and personal learning. Another survey looked at how students currently study and received interesting results, as the majority answer was a combination of both lectures and video learning. This showed that the students were already engaged with video learning and use video as a large part of the studies but perhaps didn’t have a great deal of access to video tutorials or specific video learning from reliable sources. I then wanted to ask the students whether they would be interested in having access to an archive of online video tutorials that were relevant to broadcasting and were all made by professionals currently working within production environments. This was one of the most important results for my project, as the result was exactly what I wanted. All respondents said they would be interested in having this kind of resource to learn. After this result I wanted to check which resource the students would be most interested in learning in an online environment. Once again I received some very interesting results, in which 95% of respondents said that they would like to have online video tutorials and they preferred this format of online learning to others as it showed exactly what the coverage of the lesson would be and was easy to follow. From this point I decided that there was a need for these types of websites and so I looked at other websites that offered similar resources to my concept. I therefore researched which current websites were using video technologies in order to enhance the way their users can learn and discovered that there are quite a few different uses of online video within websites, and so I decided to look at six different sites that all offer slightly different learning environments. The first site I looked at was Youtube EDU. As we all know Youtube is very famous for video but over the last few years has expanded into the education sector. It integrates videos from hundreds of different universities and colleges, ranging from student activities through to lectures and tutorials. The quality is lacking as the majority of the filming is done by students, but Youtube is really only interested in the content which they can deliver to a wider audience base. In spite of this, it is a fantastic resource for video information and gives access to lectures and other resources that would not normally be available. A very similar programme that offers almost the same thing to Youtube EDU is iTunes U. This is part of the iTunes application and offers a wide selection of lectures, language lessons, audiobooks, tours, and films all aimed to encourage the use of online video. This, like Youtube EDU, has mixed content some of which is not educational but it embraces the use of online video learning. Edu Fire is an online resource mostly aimed at learning languages, business and technical applications. However, they have taken advantage of video through the use of applications, such as Skype, and therefore allowing a more personal approach to learning a subject through video-phone calling. This site shows that there is a great use for video learning in an online environment, and also proves that students can engage with their subject and also get regular feedback from their teachers at a schedule that suits them both. Internet video magazine website is not specifically related to education, however it does offer some great sections that are for broadcast specialists, such as camcorder, video editing, and software reviews as well as some sections showing tutorials for production and broadcast professionals. This website shows that there is clearly a market for online learning within the broadcast environment. They have a good subscription rate and deal with a wide range of topics within broadcasting and production. The website is similar to Internet video magazine but offers a lot more. It also provides good quality reviews for all kinds of production equipment and has detailed articles on camcorders, editing equipment and software and also lighting, distribution and other relevant topics that producers would find useful. They also have a training section where you can book specific training with one of their experts and also an online community, which has much more information via a blog, newsletter, contests and extra resources. This site adds to the overall assessment that producers and broadcasters are interested in learning via an online environment, as long as it has been instigated well, and professionals maintain it regularly. This site is all about learning through an online platform. They have over 40,000 tutorials on the site ranging from languages to Avid editing and everything in between. They work on a ‘member-supported’ environment, which means you have to be a member and therefore there is some kind of cost involved but for what you are getting it is quite minimal. They also have a wide range of courses, but they are mostly related to design packages, although they are expanding all the time. They receive around 20 million visitors each year and they also produce 95% of the videos themselves. This really proves the point that online video is becoming a lot more common and is being used extensively by different learners. I think the fact that there are websites like these already it shows how education and learning are changing and has changed over the past few years. For example, when I studied at university there were very few online resources for me to look at and learn from, so I had to literally teach myself everything via a “hands on” approach or wait for a lecturer to show me. These days you can just Google what you are looking for and a majority of the time there will be either textual or video based tutorials available. However, this goes back to a point I made earlier about quality and how do we know that the author is either qualified or a valid source of this information? After completing these sections of the research I looked at what I wanted to offer as a resource and how I could instigate it. In order to achieve this, the website needs to have a variety of sections, each of which deals with specific areas of broadcasting and production and is using new technologies in order to enhance the learning environment. I therefore decided to split the sections into: learn, magazine, tutorials, a review and live section. Within each section they will cover a wide area of topics all related to production but essentially they all offer a learning experience. Within each of these sections there would be a variety of information, knowledge and learning resources that would be updateable and available to all learners who wanted to have access to them. By creating this type of resource, it will allow each learner to have a unique experience on the site and use only what they needed. The can also have opportunities to comment and add their own information as well and so it creates a more collaborative environment for them to learn in. There are a wide range of online learning courses available through colleges and universities but I wanted concentrate specifically on those resources that are available which relate to broadcasting and production and have tried to use video as a major part of the learning experience. When I first began looking into this subject I never thought that I would go into so much depth and look at a wide variety of things. But, I think that in doing the research I have done, it has allowed me to appreciate how education has evolved and how online resources and learning can enhance the way that education could be delivered in the future. I think that the project has shown a need for the use of online learning within a broadcasting environment. However, it does need to be very carefully considered how this could be delivered. I think that in terms of the practical project, and through the survey research I did it clearly showed that there was a need for this type of resource. I think that the development of the online resource was good but it could have been instigated slightly better, especially in terms of functionality. It offered all the relevant information and resources that were needed for broadcasters and allowed them access with ease to these. From the early development of deciding what form the website would take all the way through to the final delivery, I wanted to focus on the user and the content. I think that this came across on the website and although perhaps it lacked detail in design it had all necessary functions that would be needed in order to enhance the learning experience within an online environment. I explored a wide variety of technologies that could be instigated in order to enhance the learning experience and looked at other sites that currently offer similar things and feel that given the right educational environment my project could be very successfully developed, using a professional designer and coder. The prototype worked but if I were a web designer or coder by trade it could have been improved. However, this was not my main aim of the project. I was not looking to create an amazing website but to create a useful and informative resource for broadcasters to use and learn from. I think in terms of this I achieved what I set out to do. I think that the most important part to my project was the research and I showed that these types of online learning facilities are being used a lot more and will continue to be used in the future. As I said, online learning and online resources are being constantly used already and this area will continue to grow over the coming years. However, in terms of broadcasting I believe it needs to be seen as an additional resource, so the learners can take advantage of new and emerging technologies and also get used to learning through new and different ways including online facilities. It is clear that broadcasting and production are considered to be team environments. Working in a team environment you need to think as a team and not an individual. I therefore believe that online resources will be able to add to the learning development of students and professionals, therefore enabling them to expand their understanding of the subject matter and learn relevant technical skills that they might be lacking. I also think that constructivist learning with the addition of personal reflection can be a very positive way to learn broadcasting. This could be seen as the ‘blended approach’ and due to the fact that broadcasting is a very ‘hands on’ industry it is clear that learners need to be undertaking practical tasks, or out filming in order to have a working knowledge of the required processes. They also need to work within a professional environment. The ‘blended approach’ will allow for both the theoretical information and also the more ‘hands on’ learning, which is needed in broadcasting. However, this is where I feel that online resources can be used to benefit the learner and offer them the opportunities to learn more and also do a lot of self directed learning as well. In having access to online resources each learner will be able to take more control over their learning activities and expand their knowledge or technical skills at their own pace which might not be the case if they only were to learn within a more classroom based environment. The crossover from further education to higher education and the way in which courses are taught are very different and so each individual student should be considered and the appropriate personalized teaching methodology should be instigated. The pedagogical and andragogical experiences from student to student need to be clearly defined and understanding how these differ is vital but also how these learning methodologies impact upon higher education. It was quite interesting to think about the differences between younger learners and mature students and how pedagogical and andragogical learning experiences would differ from one another. The pedagogical experience is more related to child learning whereas andragogical is related to adult learning but when considering first year university students; their age needs to be considered before formulating which learning experience they will actually undertake. Therefore, pedagogical and andragogical learning will have to be thought about in regard to the transition from further education (school or college) into higher education (university). Clearly, this transition should be carefully thought about, as the student needs to be considered a lot more as an individual. Although, I recognise this as a serious difficulty, within the context of broadcasting I believe that each individual learner will have a distinct area that they want to be involved with more than others. Therefore, the educational facilities should consider these needs and make appropriate resources available to the learner, whether through online learning or through traditional means. This could also relate very well to self directed learning and help to enhance all students understanding of this and allow them to reflect on their own work with a lot more understanding. It’s very important for students to reflect on their work and methodologies but they will also need constant supervision from their tutors. In an online learning environment, this can be hard to achieve and so using a blended approach to learning is definitely the most appropriate, but using online resources will give significant advantages to learners in the coming future. It is important for teachers and learning facilities, whether online or not, to consider the learner as an individual rather than a collective. If this is done, then each student can take advantage of learning from both a pedagogical and andragogical method. What I mean by this is they will have opportunities for a variety of teaching methodologies and more self-directed learning opportunities. I think that this is really important when it comes to online learning as defining the user as an individual will enhance their learning methodologies and will allow them to have a full learning experience within higher education establishments. As I mentioned, broadcasting is very much considered to be a team environment and if you only learn something within an online facility, the learner will be at a distinct disadvantage when it comes to working in the future. Contact with others is essential for the growth of the learner and needs to be considered as important as technical knowledge. The learner needs to have social awareness of the broadcasting environment and this will be difficult to gain within an online facility. Of course, this could be combated by the use of online video communication tools, such as Skype, but I feel that this will not have the same impact as learning within a studio or classroom environment. I think that the blended approach would deal with this and with the use of the online resource will extend the learning opportunities significantly. Without question learning outcomes will need to be specifically developed, especially in relation to online learning and the use of online resources. Naturally, there are certain things that you cannot learn using online facilities and this can be related to broadcasting. You can only learn so much from reading a book or watching an online tutorial, you need to be physically doing or operating something to really have the full experience. For example, operating a camera, you need to actually have the camera in your hands to see what it can do. Of course, having online resources that can guide you through the use of the camera would be very useful alongside a lecture on camera operation. But, you would need to have specific learning outcomes of that online resource, so that the teacher knows that the student has fully understood all the functions of the camera and is confident in its use. I believe that having relevant online resources can enhance the learning environment for the learner as long as they have regular contact with a teacher or lecturer. Government should also be promoting the use of online resources and online learning, so enhancing the way that education can be delivered across all platforms. At present, there are a substantial number of online courses but the learning outcomes and learning methodologies that are used will not hold the same experiences as a more traditional form of education would. Government policies need to consider both methods in the future, so that facilities are delivering the most appropriate skills in both terms of technical, theoretical and social skills. These social skills are more relevant for the learner when working in a professional environment. This has been seen in the Government's recent drive to increase the number of students wishing to access higher education, and especially those from 'working class' backgrounds has led to a vast need for on-line courses to provide for these young people and even more so as there are fewer jobs available now due to the recession. This should make on-line education a real growth area, which should be tapped into. In researching how education has evolved over the years it was good to see that establishments are using new technologies and will continue to do so over the coming years. By looking at this it helped me to understand my project a lot more and see how I wanted to develop it. It also allowed me to understand how education has changed and see how higher education is evolving in modern times and see how it evolved from the introduction of polytechnics in the 1960s through to the introduction of CLC’s in the 2000’s. I think the way in which people learn has changed significantly and especially over the past few years. We have seen a huge influx of online learning courses and online resources but we should still consider traditional learning methodologies, and their sources such as books, magazines, journals, and of course, teaching and learning from lecturers or mentors. Replacing traditional forms of learning with online learning is not ever likely to happen but it is important that the source of information be very carefully considered because the source needs to come from some form of academia rather than just a Google search or Wikipedia content. Even the way that I researched this dissertation came through a wide variety of sources including books, journals, online journals, surveys, online searches but the majority of my main research came from books because the information was not available online. I think this shows that even topics such as online learning, video technologies and broadcasting, the sources of the most relevant information still came from books. As my research grew so did my research methodologies as I found new references and new information. I think that the way information and knowledge is delivered to the learner is vital to make sure they have a full comprehension of the subject matter. This is where storytelling and personal reflection are very useful for the teacher and the learner. The teacher will engage the learner through interesting teaching methods and the learner will be able to reflect on this and use the knowledge in order to enhance their own understanding of the subject. In broadcasting, this is a particularly useful tool to use because it is a very ‘hands on’ environment for the learner. By reflecting on the teaching and also on their work, the learner can satisfy learning outcomes as well as grow as a practitioner in whatever chosen subject they are learning. Even though learning subjects such as broadcasting, a university education requires the need to be able to have a theoretical understanding of the subject and this is where reflecting on your work can help the learner to fully understand the subject in both practical and theoretical elements. Although practical skills are very useful in broadcasting, it is equally as important for the learner to understand theoretical issues. These can be delivered by lecturers, with the options of having online resources available. In having these resources available, the learners can do a lot more self-directed learning in their own time and then within the classroom can have more subject specific teaching. With the right online resources available to the learner they will be able to have a distinctly fuller educational experience. I think it’s also very important when learning a subject such as broadcasting that it is delivered within a community and collaborative environment, whether this is an online or classroom based environment. Both of these environments could be considered as having a ‘community feel’. However, it is the way in which the learner interacts that will give it a community feeling or not. Naturally, because broadcasting or production is a team environment, it makes sense to learn using a more traditional method but with the use of online resources in order to enhance technical skills or knowledge. It is therefore important for the learner to understand the need to work collaboratively, as this is what they will be doing in professional practice. We can see from the research that there are significant numbers of online resources but will these resources offer the same learning experience that you would get from practical experience? I think at present this is not possible to answer because online learning is so new. However, in the future we will be able to understand whether or not these types of learning methods enhance the educational process or not. Obviously, online learning is becoming a lot more popular these days and this is causing more universities to offer these types of courses but what kind of competitive environment will this lead to and how will the learner be able to experience this without physically being in a classroom? It could be considered that this type of learning is not competitive because it is self-directed rather than in a more community or collaborative based environment. This is something I have experienced whilst studying for my Master’s Degree. In doing this, I have had to do most of my work on my own and therefore I’ve had to reflect a lot on my work in order to learn. This has resulted in me changing my methodologies and also the way I think about education and learning. Sometimes competition can be a positive factor in education but if the learning experience you have is the same as everyone else how can you differentiate yourself from others? I think this is becoming an ever more difficult question to answer. If all learning experiences are the same and the outcomes are the same, then what makes the learner unique? I think that in terms of broadcasting it will come from the learner’s experiences and willingness to learn more and have more technical skills than others. Progress can therefore come from self motivation and we will see in the future the individual taking more control of their learning experience. Therefore, educators need to understand this and offer new types of learning environments or resources that will benefit these new learners. It is essential to think about how educational facilities will change in the future for these types of learners and the way in which education is delivered. Trying to get the right mix between traditional and online learning will be required for these facilities. For example, broadcasting will always need technical skills and equipment and so the facilities will need to have these available for the learners. This is something, at present, online learning would find difficult to compete with. However, in the future, I think we will see online resources being used a lot more when it comes to teaching technical skills and I think educational facilities can therefore take advantage of online resources, if they are relevant to the subject that is being taught. It would of course also depend on the learner and whether or not they would use these resources to improve their learning experience. I believe that the way in which online learning or online resources will be used in the future will have to be very carefully considered by each establishment, and when they have a full understanding of the need and how they can use it for their learners and we will see a much more affective use of online learning. The passing on of this knowledge and/or skills is essential and has always been the key driver behind education but we also need to consider how human behaviour has changed the way that this information is passed on. In particular, we need to consider how people will learn in the future and how establishments will meet this demand for the ever-changing world. I think that in the future we will need to consider the individual a lot more and make sure that their learning experiences can be unique and I think that with the correct use of traditional and online resources this can be achieved successfully. I think that the research I have undertaken and the main idea behind the project has led me to think even further about this subject as well. I feel that there is a need for these types of resources to be made available to the learner and I think in the future the idea of learning within an online environment will become a lot more commonplace and I hope to see universities take advantage of these by giving learners new and interesting resources in order to develop their learning experiences. Overall, I feel that I have gained a lot of knowledge about these subjects now and have also learned a lot about myself by writing this. I hope that I can continue to research these subjects and that what I have written can also lead into further research. I am very interested to see how education will evolve over the coming years and embrace the use of online resources, all with the main aim of enhancing the way we all learn and try to take advantage of new and emerging technologies in the future within educational facilities. I think in the future and with newer technologies changing and updating so quickly, we should consider that we are all now becoming learners as well as teachers and if we embrace this and use it to our advantage, we will be able to prosper from new technologies and learn like we have never learned before. Citizenship and Democracy, London, Sage. Apple, MW and Buras, K (eds) (2006) The Subaltern Speak Curriculum, power and educational struggles, New York, Routledge. Dale, R. (1989) The State and Education Policy, Buckingham, Open University Press. Henry, M., Lingard, B., Rizvi, F. and Taylor, S. (2001) The OECD, Globalisation and Education Policy, Oxford, Pergamon Press. Globalization and Social Change, Oxford, Oxford University Press. Lingard, B. and Ozga, .J. (Eds) (2007) The RoutledgeFalmer Reader in Education Policy and Politics, London, Routledge. Ozga, J., Seddon, T. and Popkewitz, T. (Eds) (2006) Education Research and Policy Steering the knowledge-based economy, London, Routledge. Politics of Change, London, Routledge. Ben Sawyer and Dave Greely, 2001, Online Broadcasting Power! Educational Psychology Review Hmelo-Silver, C. E. (2003).